Pasquale’s love of Italian language and culture is apparent in his CDs: “My Passion” (2000), “My Destiny” (2004), “Naples … That’s Amore!” (2005) and “Il Fornaio: Authentic Italy, Vol. 1” (2008). These CDs reveal Pasquale’s remarkable capacity to perform both classical and contemporary Italian, English, Neapolitan and Spanish standards. Presently, Pasquale is finalizing his latest CD: “A Brand New Me” consisting of original compositions in his distinctive pop-opera style. The making of this CD was an international collaboration of many talents, including but not limited to: songwriters, musicians, composers, arrangers, lyricists and sound engineers. The recording of the CD took place in Italy and the United States. The transatlantic fusion of cultures and musicians resulted in a spectacular CD which is expected for release in 2009, followed by an international tour. Aside from recording CDs, Pasquale has toured both in the US and abroad with several musical productions and concerts. 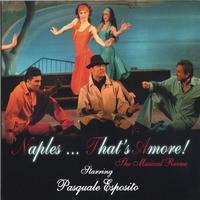 From 2005 through 2007, Pasquale toured with the Italian musical revue: “Naples … That’s Amore!” (www.naplesthatsamore.com) Pasquale and Ettore Squillace, an accomplished director and choreographer from Naples, Italy, collaborated to write, direct and produce this production. The show toured in the following cities: Santa Clara, CA, Stockton, CA, Pompeii, Italy, Naples, Italy, San Francisco, CA, Monterey, CA, San Jose, CA , Los Angeles, CA, Canoga Park, CA, San Diego, CA, Chicago, Il, and Boston, MA. The last run of the show was presented at the historical Teatro Bellini in Naples, Italy in the spring of 2007. In the fall of 2007, Pasquale had the opportunity to tour with Gigi D’Alessio and Anna Tatangelo, two of Italy’s finest pop artists, during their 2007 North American Tour. Aside from touring with these artists, Pasquale introduced his original music to the public for the first time in his own 2007 concert tour of “Simply Pasquale!” The concert series debuted in San Jose at the Montgomery Theatre in October and was later followed by performances at The State Theatre in Modesto and The Herbst Theatre in San Francisco. “Simply Pasquale!” will continue to tour this fall with stops in San Diego, Boston, Chicago and Italy. Amazing album. I loved listening to it. Thank you Pasquale for sharing your gift of song with us. The show was absolutely great and the CD captures the magic for reliving the pleasure. Pasquale is superb in this CD and the new arrangement of Con Te Partiro (Time to Say Goodbye) is wonderful. The variety of the music on these CDs (it's actually 2 CDs) will keep you entertained for long hours without getting bored. Way to go Pasquale, thanks for sharing your talent with us. beautiful sound, from happy, exciting to romantic this cd gives a lot of everything. I saw the show twice and loved it. I love the new CD and have worn it out already. I especially love to listen to #9 Volare medley. It reminds me of all the weddings I went to as a little girl. Pasquale has gotten better every year. His love and passion comes through his music. Bravo!! middle of winter in Chicago area. Tanti Gratzie!!! OPRAH needs to hear you!